phpMyAdmin is a free server side PHP application for administering MySQL Databases through a Graphical Interface which MySQL lacks for managing it. Previously, we published article on MySQL, we wrote that, MySQL by default has no GUI. This is why we need some software like phpMyAdmin to manage our database in an easy way. This is what phpMyAdmin serves to do. The administration of MySQL is done via HTTP using a browser when phpMyAdmin is installed. Therefore, even databases are on other computers over a network connection or via the Internet they can be administered without shell access. For the use of the program phpMyAdmin is no knowledge of SQL is necessary. This software is available under the GNU General Public License and it can be used on Cloud Database as well as on traditional servers. There are also other softwares to do the same work, however it seems that it is most popular among CMS users like WordPress. phpMyAdmin does not apply any special security to the MySQL database. It is administrator’s job to grant permissions on the MySQL databases. Official documentation of phpMyAdmin is available on the official website. However, we are proving a short guide on phpMyAdmin. Version of this software differs in look and the phpMyAdmin used for Cloud Database has additional options for selecting the database server. Keep in mind, in phpMyAdmin, if you delete a table or row, the action can not be reversed. For cloud database, phpMyAdmin can be opened with a separate unique URL and managed in an easy way. This Article Has Been Shared 1120 Times! 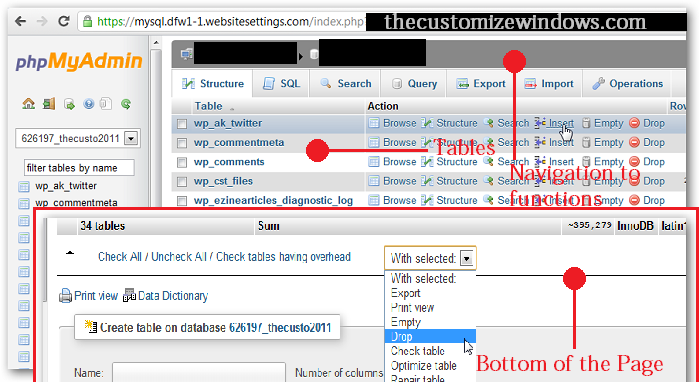 Cite this article as: Abhishek Ghosh, "phpMyAdmin : Functions and Handling," in The Customize Windows, April 1, 2012, April 24, 2019, https://thecustomizewindows.com/2012/04/phpmyadmin-functions-and-handling/.